The Preliminary Inquiry (PI) into the murder of Agricola resident Gladstone George, who was shot dead execution-style in April last year, continued yesterday with a traffic cop giving his testimony. 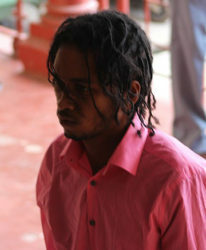 Orpheus Johnson is charged with George’s murder. Yesterday, traffic cop Michael Ramdas testified at the Georgetown Magistrates’ Court. He was led in giving his evidence by Police Prosecutor Vishnu Hunt. Presiding over the matter was Magistrate Judy Latchman. The matter was adjourned to today for continuation and more witnesses are set to testify. 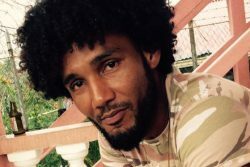 Johnson, 29, of Second Street, Craig, East Bank Demerara, is charged with killing George, 32, of Lot 40 Brutus Street Agricola, in a minibus on the Agricola Public Road on April 22 last year. An eyewitness had told Stabroek News that he was standing on the main road when he heard two gunshots and subsequently saw passengers rushing out of a bus. George was later seen slumped in his seat with a gunshot wound to his head. A source had told this newspaper that the man was seated in the back seat of the bus which was stuck in traffic as a result of a fire at a gas station at Eccles when someone on a bicycle rode up to the back window of the bus and shot him before escaping. Stabroek News had previously reported that there were previous attempts on George’s life. In February 2015, he was robbed and shot by a group of gun men at McDoom on the East Bank. 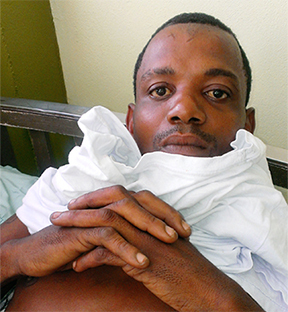 George had told Stabroek News that he pretended to be dead and this might have saved his life. “I played a dead game on them and I could hear one of them saying, ‘Check he for money… check he pants.’ But all the time I calling God to help me,” George had said.